It’s the latest trend in beauty care. Using a mini rolling pin on your face. While it may seem like a weird – OK, really weird – thing to do, the technique has been around since the 7th century. Originating in China, the mini rolling pin was made from jade, a semiprecious stone that was highly regarded for its healing properties. Since then, apparently scientific research has discovered that jade is a natural transmitter of far infared rays. They emit low levels of heat which enables the jade to warm up the skin and boost microcirculation. Now that you have the goods on the what and why, let’s get to the how. It really is pretty easy. Rolling gently down the hill of your face is detoxifying and stimulating to lymphatic drainage. That’s a good thing. The lymph system is responsible for mopping up yuk and to help it do it’s job has got to be a bonus. Rolling uphill, as we know, needs a more vigorous approach. So it is with the upward rolling on the face. This movement stimulates and oxygenates the skin. That too is a good thing. My little two headed rolling pin did not take overly long to arrive in the mail. I cleansed it and popped it into my amethyst cave to recover from the long trip and absorb some good energies. When it was ready, I set the table up for my new beauty care routine starting with the usual cleansing, exfoliating bits. Obviously the bigger roller thingy is for the bigger bits of the face, and the little one is for, well, those smaller spaces. Start at the base of your neck. Gently roll downhill from ear to collar bone. Repeat three times on each bit working across your neck from the ear to center line. Next go to the middle of your chin. Roll your way to the hair line. At the end of your third time, drain the lymph by rolling down the side of the face toward the collar bone once. Keep merrily rolling along across your face. Three is the magic number. And don’t forget to drain. The small end of the roller is best under the eye. Roll three times from the nose toward the end of the brow. On the last roll, finish by rolling downhill to the collar bone. Do it gently just under the eyebrow too. Last, gently roll from the center of the forehead toward the side of the face, drain. You might want to repeat the draining bit a few more times if you find yourself swallowing a lot. That’s a good thing. Means the lymph is draining away all that yuk. Start at the neck. Roll uphill now from base of neck to jaw line. Your pressure should be medium to firm. Repeat this 5-10 times, then move to the next section. Repeat till you’ve reached the center of your neck. Next, roll from the chin to your ear just under your jaw line. Repeat 5-10 times. Move up to the center of your chin, rolling from chin to ear in a slightly upward angle. Repeat 5-10 times. Repeat these movements working up the face, finishing under the eye. Next comes the forehead. Roll from your brow to the hairline in a vertical upward movement. Repeat 5-10 times. Repeat working your way across the forehead. The smaller roller is good around the crow’s feet, between the brows around the lips to fine tune those fiddly little areas. You could stretch the skin – not too tight😵! 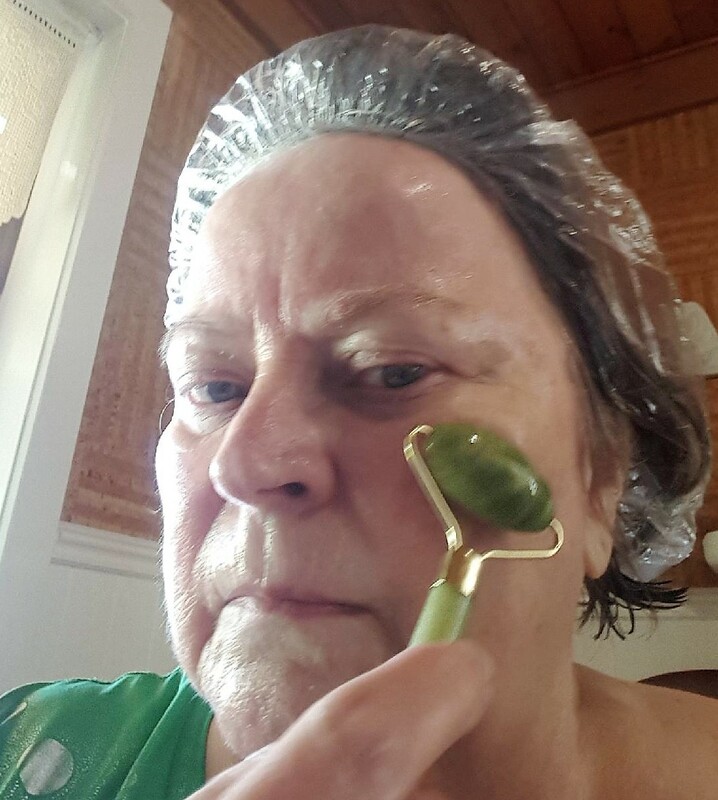 – with the other hand and use the roller a bit like a rubber across the pesky lines and wrinkles. It just might smoothe them down a bit. I found that the roller stayed cool on the skin even after more vigorous use. But you could cool it down more by popping it in the fridge for a while. That would feel good on a hot day and probably help soothe puffy eyes. 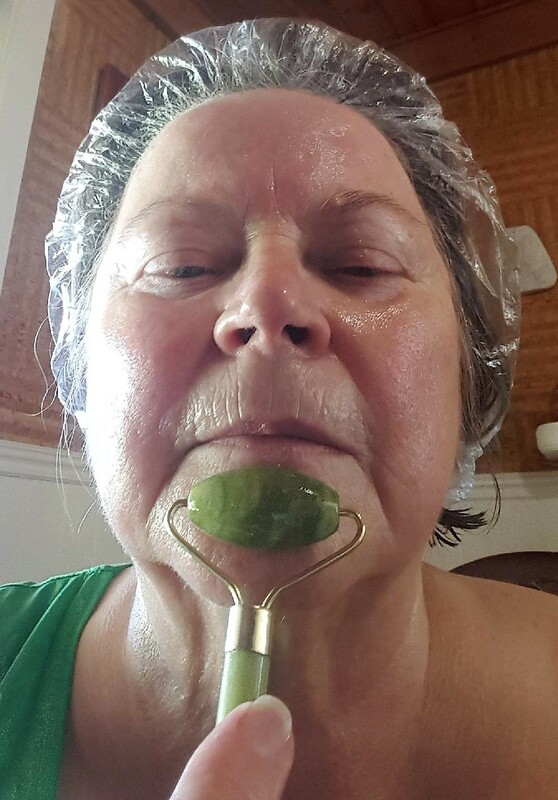 You can use the roller over a sheet mask too if you want to intensify the treatment. Or use it to apply face creams and serum. Just enjoy the experience! My mother-in-law was very overweight and she had a big body roller with dimples on. It was supposed to roll the fat off the body. She used to have it sitting on top of a big heap of slimming magazines next to the seat she spent most of her day sitting in. I can imagine her rolling her body in between trips to the fridge where she kept a huge sore of mars bars and ice-cream which formed the basis of her diet. Sounds interesting. Never seen body rollers! New to me. Where did you get the roller? I read about it in our Sunday newspaper. Found the roller on-line. It only cost AUD 5. There’s lots of them, in different stones too. And prices. I must say I was pleasantly surprised at the quality of the roller given the price. I only paid AUD5 for mine. Not sure what that is in pounds – around 2?